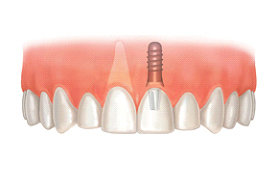 Single teeth: individual teeth can simply be replaced by a single implant. The final result is like having a new tooth which is not loose or removable and which looks like a natural tooth. 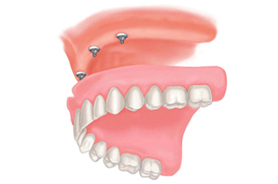 Multiple missing teeth: several missing teeth can be replaced with two or more dental implants. 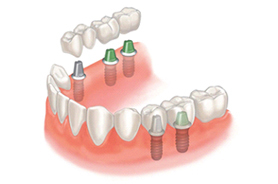 A bridge secured onto these implants provides a secure and comfortable way of replacing several missing teeth. Supporting full dentures: Traditional full dentures replace all missing teeth. Commonly patients complain that full dentures are not secure and can move when eating, talking or laughing, causing embarrassment. These loose dentures can be uncomfortable as they irritate the gum, causing ulcers and can feel bulky to patients. Implants have solved these problems for our patients of all ages. 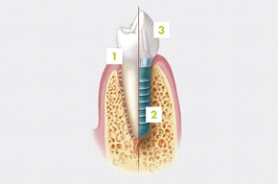 Two to four implants are all that are required to allow dentures to click into place onto implants. Dentures don’t move with eating and will not fall out when speaking eating or laughing. This gives our patients confidence and the ability to eat what they want, where they want.